Sandcastles will be open special hours during Spring Break: Friday, March 22nd-Sunday, April 7th. Hours are Monday through Saturday from 9:30am-3pm and Sundays 12-4pm. Sandcastles Children's Museum offers special activities during normal business hours throughout the fall. Unless otherwise noted, special activities are free with regular museum admission and go on for the entirety of open hours. Sandcastles Children's Museum has been in operation since 2006, and first began as a "summer sampler museum." Visitation to the Museum has grown from 1,500 its first year to more than 20,000 annually since 2011. They first occupied a small building on South James Street, then moved to a larger facility four times bigger on West Ludington Avenue. Now they have found a permanent home in the former Elks Lodge, at the corner of North Harrison and Ludington Avenue. Through donations and many volunteers, the building has been renovated to transform it into a kid-friendly and sought after destination. Fall/Winter/Spring hours begin after Labor Day and are Fridays from 9:30am-1pm, Saturdays from 9:30am-3pm, and Sundays from 12-4pm. Summer hours are Monday-Saturday 9:30am-5pm and Sunday 12pm-4pm. Have your child's next birthday party at Sandcastles Children's Museum! $100, includes two adults and four children from one family. Each additional family member is $10. Adults are interchangeable, children are not. $100, includes two adults and all of their grandchildren. Only four children may be admitted at one time. Children are interchangeable, adults are not. $75, includes one adult and one child. Adult is interchangeable, child is not. 2019 Daily Admission is $7 per person. Children under age 1 are free. Call or visit Sandcastles during open hours to purchase your membership! The newest exhibit at Sandcastles was added in February of 2017 and is a Hospital Baby Nursery sponsored by Spectrum Health Ludington Hospital! The exhibits at Sandcastles keep growing, thanks to local volunteers. 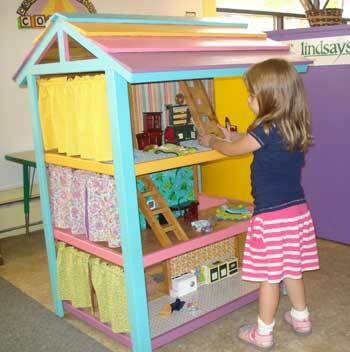 The exhibits invite hands-on interaction for children from birth to 12 years old. John Bloomquist of Chicago has donated an LGB electric train to Sandcastles. It adorns the rim around the dome of the upper play level of the museum, so children can see it, but not get hurt. There is even a train whistle that kids can pull. The Little Castles Puppet Playhouse is a puppet stage sponsored by the Michigan Council for the Arts and Cultural Affairs. During the museum's Summer Hours, Puppet Shows are held at 11am Tuesdays and Puppet Playtime is from 10am-12pm Thursdays in the lower level. 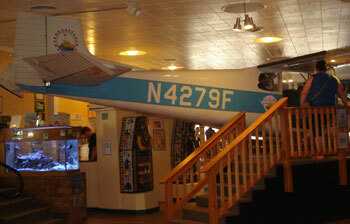 In 2013, an actual 1958 Cessna 172 was purchased and then donated to Sandcastles by the Mason County Pilots Association. To go along with the Cessna is a Control Tower, where kids can use radios, lights, and sounds to communicate with whoever is "flying" the plane. Kids get their own passports and experience going through customs and a baggage claim area. 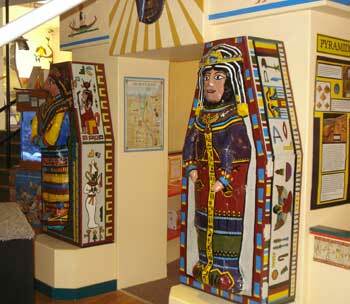 Another exhibit, "Egypt", features sarcophagi and a station where kids can create their own hieroglyphics. An archeological dig with sand and pulleys complete the "Egyptian" feel of this exhibit. The West Shore ESD career tech program donated its own exhibit to Sandcastles. They also built a two-story bilingual dollhouse, where half the house is labeled in Spanish and the other half in English. Exhibits added in 2012 were the Bouldering Wall, a horizontal climbing wall presenting a new kind of challenge and fun for Sandcastles visitors; a Saltwater Fish Tank Watch with new fish and other sea life added throughout the year; and Construction Zone, where children can build creations of all kinds using less common building toys as well as some old favorites. 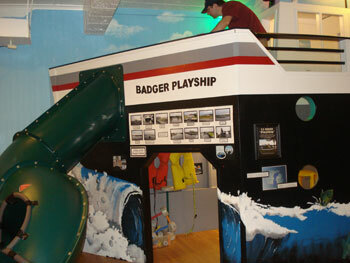 Check out the Badger Play Ship modeled after the S.S. Badger carferry and featuring a slide. Children are captivated by its many attractions, including real instruments, a wheelhouse, space to drive cars on and off, plus nooks and crannies to play in. A telescope is used to find the hide and seek animals along the top of the climbing wall, located across from the playship Badger. Other great activities for kids include the Vet Center, Discovery Bins, Post Office, Theater Stage and Dressing Room, Art Center, Ice Cream Parlor & Pizza Restaurant, and Grocery Store. At the Planting Gardens, children can pick and pull vegetables and learn how they grow. The bubble table lets kids create giant bubbles, perfect for popping! If you would like make a donation to Sandcastles, you may write a check to the Community Foundation for Mason County and send it to Sandcastles at P.O. Box 595, Ludington, MI 49431. Or go online to mason-foundation.org to make a credit card donation directly to the Sandcastles Capital Campaign fund.